Is Your Lawn Or Garden Being Overtaken By Weeds? Weeds growing in your lawn and garden are unsightly, they only get worse as they continue to spread if not taken care of, and they bring down the impact your beautiful yard and garden should have on your property value. 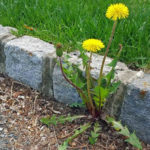 There are many different types of invasive weeds that grow in our area of Manitoba and many different ways to take care of them so they don’t make your property stand out for all of the wrong reasons. Many of our customers are often surprised to learn that one of the best ways to defend against weeds in your lawn is to just have a thick, healthy lawn that is being well-cared for! When your lawn is healthy it’s very difficult for weeds to grow as the thick grass will choke them out and doesn’t allow them the room they need to grow and spread. To get a thick, healthy lawn that fights off the spread of weeds you need to make sure your lawn is well fed and you must be careful when mowing. You don’t want to cut more than 1/3 of the grass height and it’s really important not to “scalp” the lawn. Scalping is when the mower is set so low that the blades actually contact the ground, removing large chunks of lawn and exposing the dirt/soil below. These are usually the places that weeds will begin to take a foot-hold. What Types Of Weeds Are Most Common In Winnipeg? There are a variety of invasive weeds that can take over your lawn and garden areas in Winnipeg. When researching weed control services you’ll probably read about “broadleaf” weeds. 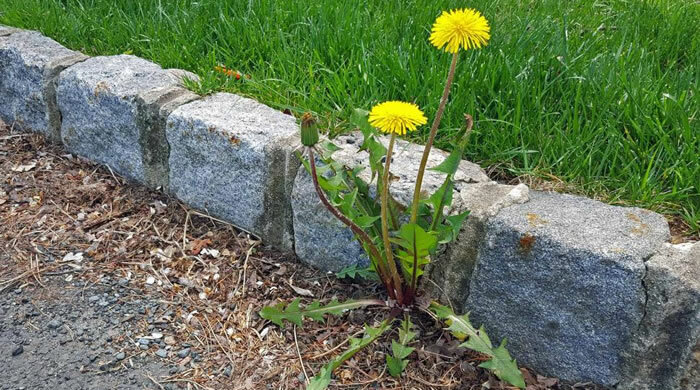 These are generally the most common type of weeds found in a lawn area, they can be very aggressive and will attack an unhealthy lawn. Here are a few of the most common broadleaf weeds and how we usually deal with them. 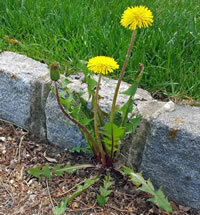 If you’re looking for the nice, uniform appearance of a healthy green lawn you don’t want Dandelions scattered about. The good thing about them is they are not a very strong weed and the root system is fairly shallow. They can be hand pulled from gardens and small lawns but often by the time a professional is called it’s beyond hand-pulling and they need to be sprayed. Left unchecked Dandelions are very quick to spread as the flowers develop into the very recognizable “puff balls” with hundreds of fine strands (that act as parachutes) and each hold a seed. They are readily carried by the wind and blown about your lawn and neighboring properties too. 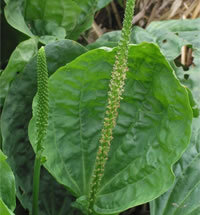 Like most of the invasive weeds we see in lawns and gardens the broadleaf plantain also originated in Europe and Asia and was brought to North America by early settlers. While it’s unsightly when growing in a nice looking lawn, many people don’t know that broadleaf plantains are actually edible and very nutritious. They are widely used around the world as a medicinal crop and mixed into poultices of varying types to help with many types of ailments. We handle a broadleaf plantain problem much the same as a Dandelion problem and they are susceptible to the same kind of herbicides used on other broadleaf weeds. 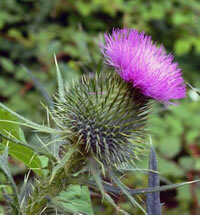 Thistles are very invasive weeds and they can grow to be very large if they are left alone. Thistles also spread very quickly if they are able to flower and goe into full bloom. Thistles love to grow in bare soil so if your lawn isn’t very thick or has bare patches or has been scalped by a mower, these are likely areas that thistles will begin to take hold. Depending on how many you have, thistles are easy-to-spot and because of their shallow single tap root they are often easy to pull out by hand. It’s important to wear really thick gloves or use a removal tool of some type so you don’t get your hand pricked as Thistles are spiked along their leaves and the stalk. 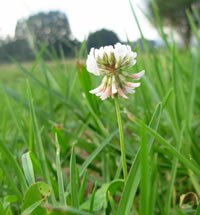 White Clover is commonly found in lawns throughout Winnipeg. This is a perennial weed (it grows back every year) that stays very low to the ground. It’s typically found in lawn and grassy areas that are bare or where competition from grass or other plants is very weak. If you have an unhealthy lawn then clover is very likely to make it’s new home there. The first step to get rid of white clover in your lawn for good is to start a healthy lawn care program with regular mowing and fertilizing. Because white clover thrives in low nitrogen soils the fertilizing helps to increase nitrogen content, making your desirable grass grow healthier while making it less desirable for the white clover. To remove White Clover from your lawn permanently (especially if it’s a large area that is covered) it’s best to start a regular weed control program and have them sprayed by a professional with a few targeted applications. This is generally enough to kill the White Clover and with a regular lawn care program you can keep it at bay. Many of our customers are against using spray products of any kind on their property but sometimes it’s really the best method of control. The weed control products we use on our clients properties are safe-to-use when applied by a certified professional. If you have a large lawn area spraying the weeds is usually the most effective. The products we use for weed control will kill the weeds including the root system as the plant absorbs the herbicide. Spraying weeds should usually be done by a professional. There are many different herbicides available to control different types of weeds and they all work differently when it contact with the weeds and your lawn. It’s important to know the variety of weeds we are trying to control so the proper herbicide can be chosen. When you have some smaller garden beds or boulevards you need to have weeded than hand-pulling the weeds can be very effective but the labour cost will go up as weeding by hand takes quite a bit of time. It also depends on the types of weeds we are trying to control as some are much easier to pull out by hand and the entire root system comes with them. This is the ideal situation because if the root breaks while hand-pulling, those weeds are going to grow back even stronger and it doesn’t take very long. However, changing soil conditions (hard vs soft) and the different root systems of the particular weeds on your property will be the deciding factor in how we’re able to handle them efficiently. Clover for example is a very invasive ground covering weed. It will intermix with your lawn and become so tightly woven that hand-pulling with any level of success is pretty much impossible. Can Herbicides Cause Damage Or Kill Your Lawn? Yes, they certainly can damage your lawn if they are not chosen carefully and applied correctly. There are many types of herbicides that are very deadly on weeds but they are also not very friendly to your lawn. If possible always avoid having your lawn sprayed right after it’s been mowed. The freshly cut grass ends can absorb the herbicide and you’ll end up with dead grass. It’s also important to try and have all your spraying done on a hot, dry day. The drier the better as the herbicide can be absorbed directly by the targeted weeds and not your grass or gardens due to run off. How Long Does It Take For Weed Control Services To Work? This depends on the condition of your lawn or garden and the types of weeds we are tying to remove. The weather also plays an important role in how long it will take to work as wet weather (rain) will slow the process down. The fastest results are usually attained when the weather is warm and sunny and the weeds readily absorb the product when it’s been sprayed. When it’s dry out the application is very targeted and we can spray only the weeds that need to be eradicated. Wet weather can actually spread the herbicide onto your grass or other plants you might not want to remove. If it’s a simple garden bed or two then we can usually rid the area of weeds by hand-pulling in less than a day. 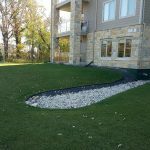 If it’s a large lawn area on a residential development like a town-home or condo then we need to use herbicides and the process can take several weeks to work as intended. 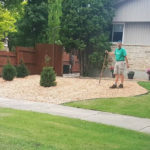 We provide professional weed control services throughout the Winnipeg area. Our certified technician will be able to assess your particular property identify the species of weeds that need to be removed and come up with a specific plan to take care of your weed problem. Whether it’s by using proper herbicides or hand-pulling we’ll be able to rid your lawn and garden of unsightly weeds. 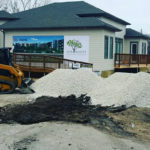 We can take care of properties of all sizes including residential properties with intricate landscapes and gardens or commercial developments and properties and also large residential developments such as townhomes and strata developments. 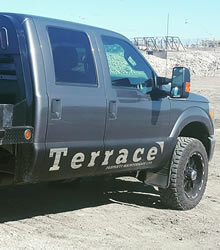 If you’d like an estimate for weed control services please call (204) 202-6939 or fill out our contact form and we’ll get right back to you as soon as we can.